Spring break is over and we are back to normal/crazy here. I took a few days after we returned from Florida while the girls were in school and Brian was at work and didn't do much while they were all away during the day. It was lovely. It's now time to really get in the swing of things and face the end of the school year head on. FYI I don't really want to do that, I'd rather bury my head in the sand and pretend our lives aren't changing. So before that happens let me do a little recap of our truly fabulous spring break vacation. Last year when we looked ahead to when spring break would be we saw that Brian would have the whole week off at the same time. That does not happen very often and since it would be Samantha's last high school spring break we decided to go big. Walt Disney World big. Brian contacted a friend from his time in residency in Detroit that LOVES all things Disney. We had not seen this friend and her husband in 15 years but had maintained minimal contact with them during that time. Anyway, they were excited about meeting us for spring break and invited us to stay with them in their Disney vacation club condo. Brian and the girls were super excited about going back to Typhoon Lagoon and exploring the rest of the Disney parks. Brian and I were also really looking forward to spending some time with our friends. Our flight to Florida was Saturday April 12 - Gretchen's 14th birthday. 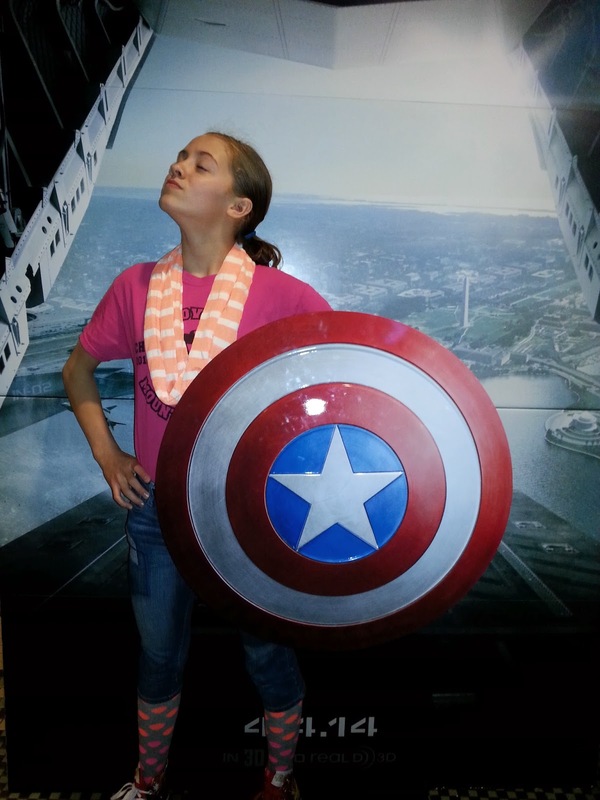 Friday night we took some of Gretchen's friends to see Captain America The Winter Soldier for her birthday. We loved the movie. Saturday we left the house at 8:00 am and arrived at the Kidani Village in the Animal Kingdom Lodge by 6:00pm. It was quite impressive. Our friends had told us that the balcony of our room would look over the wild animal savanna but we didn't really expect to see giraffes and zebras standing below us. So that was pretty cool. We spent the next 6 days exploring Epcot, Magic Kingdom, Wild Animal Park, Hollywood Studios, Downtown Disney, Blizzard Beach and Typhoon Lagoon. It was AWESOME. We ate super delicious food, watched amazing shows, went on great rides, rode some fantastic waves, laughed a ton, walked miles and miles each day, were in awe at the detail in all things Disney, and were most grateful to spend such a fun week with each other. Body surfing at Typhoon Lagoon on a not so hot day - no one was there! Loving the roller coaster water slides at Typhoon Lagoon. Riding the monorail with our friends. I'm pretty sure it won't be 15 years before we see our friends again. I'm also pretty sure that there is no one I'd rather spend my time with than Brian and our girls. We saw a guy wearing a tshirt that read "I brought the awesome. What did you bring?" I think that whenever I go anywhere with this family of mine! Loved this post! So fun to hear about your trip and see pics.